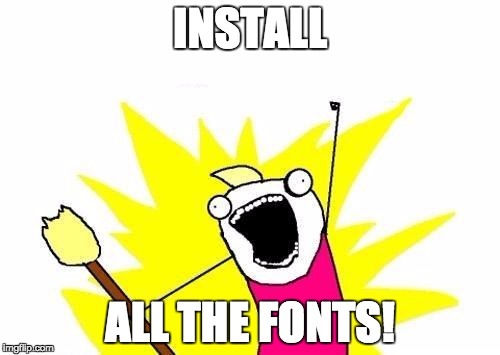 Today, I needed to pick up a few fonts from Google Fonts. Usually, I’m just linking to them from my code, but this time I needed to download and install them. Open your terminal. If you don’t know how to, do some Googling. Pleasantly wait for the script to run. Yup. That’s it. Every font from Google Fonts is now installed. Celebrate, drink a beer, and figure out what you’re going to do with all of that extra free time. For the paranoid (and those who know better than to run anonymous code), the source to the script is available on GitHub. I’ve also taken the liberty of embedding it below as well. Enjoy. # For OS X-based systems. echo "Installing all Google Web Fonts onto your Mac"
echo "Fonts installed; Cleaning up files..."
echo "All done! All Google Fonts installed." I came across this one today, thanks to my friend David Bisset (seriously, follow him on Twitter. He’s full of awesome resources). For people like me who are terrible when it comes to design, it also comes with a few button classes. Don’t need the styling? Just don’t use the CSS file. Simple as that. Not only is it full-featured and so easy that my technologically-impaired mother-in-law could use it, it’s tiny as well. Weighing in at 6.12KB, it’s hardly noticeable in terms of added page size. Since you don’t have to rely on other libraries either, there isn’t any added bulk or extra maintenance to deal with. Check it out. I dig it.